For me this week was busy busy, good good. In the good column, I (sort of) entirely ditched my sinus infection, made some headway on my cookbook project, I got to play field hockey (albeit kind of poorly) on Tuesday, bought the prettiest orange tulips and caught up with a good friend on Wednesday, had some ice cream (while catching up on the Mindy Project) on Thursday and also accompanied Ben on a very thrilling (and rather expensive) trip to buy a surfboard. Quite a week, I tell you. I’m keeping it short and sweet today, so everyone can get on with it and enjoy the weekend. 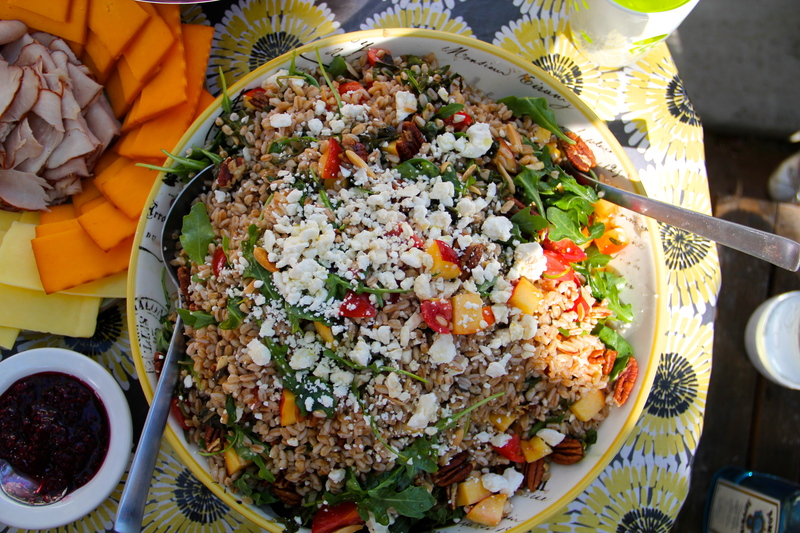 Make some farro salad, maybe? 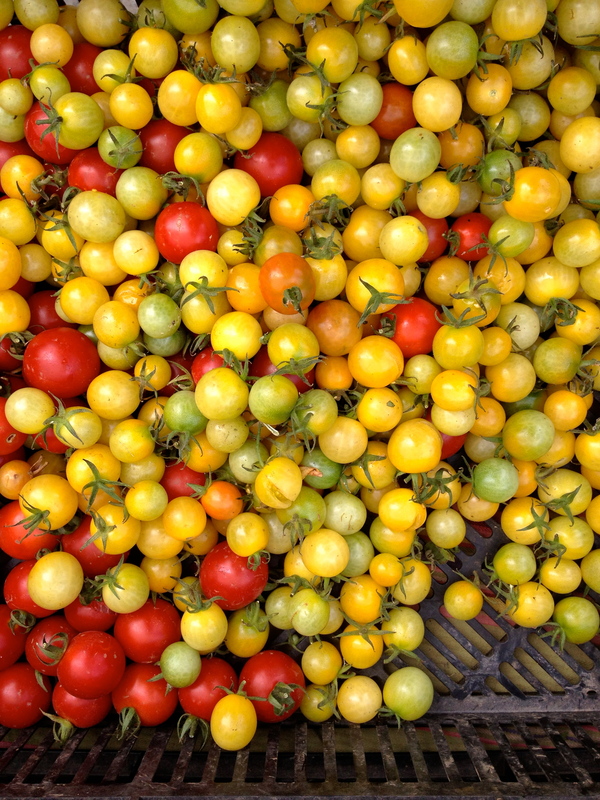 Toss in those late summer (early fall, now) tomatoes and anything else that shouts “eat me!” from the Saturday market stalls? Is that an inappropriate thing to say? I made this salad for a baby shower a few weekends ago when peaches were still good and juicy, but I also think it’d work beautifully with apples or pears, instead. I love how the toothsome farro is brightened with fresh arugula and herbs, slicked with good olive oil and sherry vinegar, tumbled with sharp cheese and sweet fruit. It lets us enjoy the last of summer’s best produce while offering an open hand to fall — it’s something to put in the good column, I think. Bring a large pot of salted water to a boil. Add the farro and cook until just tender, about 25 minutes. Drain well and set aside until no longer steaming hot. In a large bowl, mix together the farro and remaining ingredients until well combined. Season to taste with plenty of salt and pepper. 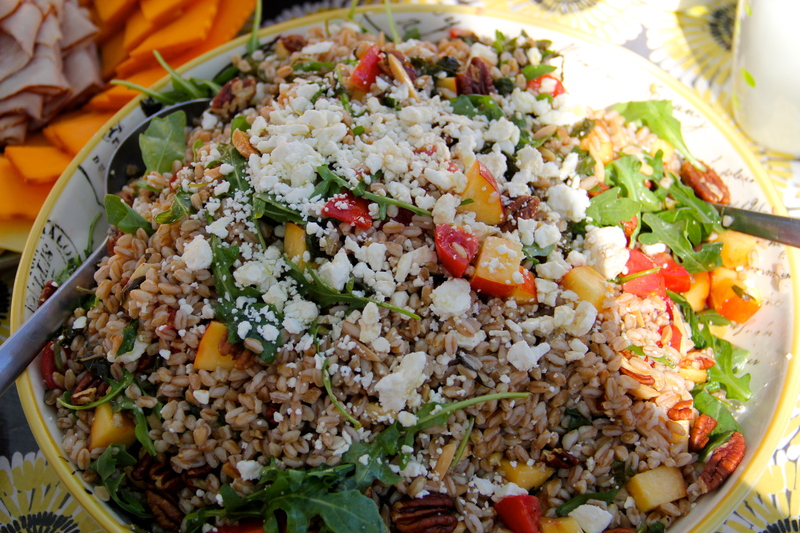 Enjoy farro salad warm or at room temperature. LOVE! This needs to be in my face.